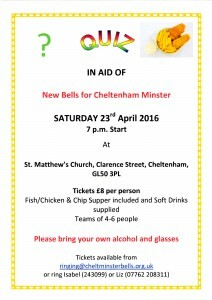 A very successful quiz night was held on 23rd April 2016 at St Matthews church. Ten teams representing the Minster Bell Ringers, The Friends, St Christopher’s, Leckhampton and St Mark’s fought out a close competition which was won by a team from the Friends. There was a fish & chip supper and a raffle and £200 was made for the Bell Fund.